I decided to write this document while I was trying to get the best ouf of my tablet pc with my favourite Linux distro. Please send me a mail with "[C300]" in the subject if you find errors or have useful info to extend/refine this document. Thankyou, and sorry for the poor English!! - are able to install not mentioned but obviously needed stuff during the configuration process (compilers, interpreters, libs and various system tools). If you're not confident with the packaging system read the APT how-to or use Synaptic (# apt-get install synaptic). If you never compiled a kernel, please read carefully the Kernel Build Howto. Configure the kernel source stripping down useless stuff and choosing the right components to compile. You may want to refer to the debian .config of your current kernel (look in /boot) or you can start by my .config file (kernel 2.6.12.3, use make oldconfig if configuring a newer version). There's a lot of stuff I don't know about many (all?) kernel components, so suggestions and improvements on the configuration are welcome. Compile and install the new kernel. * Note: if you choose to skip the kernel update/compilation, you need to prepare differently your system for module compilation by installing the appropriate debian packages. AFAIK an easy way to do this is letting module-assistant do it for you. Graphics and audio should work without particular tunings. You may want to install alsa-packages and configure a sound daemon, but this is out of the scope of this document. For the X configuration, I set a generic 1024x768 24bit lcd display and choose the "i810" driver for the 855GME chipset. AC'97 Audio: snd_intel8x0, snd_ac97_codec, snd, soundcore (snd_pcm_oss, snd_mixer_oss, snd_pcm, snd_timer, snd_page_alloc). Check also that you have installed all the needed packages to have hardware acceleration! Now I suggest you to enable ACPI and the processor frequency scaling, if they aren't. For additional info about about acpi features and cpufreq governors, google is our friend. Now you have to bind the unknown keys to some keycodes, to be able to use them in some way. As suggested by the Acer Hotkey driver author, we press the buttons and look at the kernel messages. Aug 12 18:19:29 tablet kernel: atkbd.c: Unknown key pressed (translated set 2, code 0x6c on isa0060/serio0). Aug 12 18:19:29 tablet kernel: atkbd.c: Use 'setkeycodes 6c <keycode>' to make it known. and we look at /usr/include/linux/input.h to find some usable keycodes. Aug 12 18:44:00 tablet kernel: atkbd.c: Unknown key pressed (translated set 2, code 0x69 on isa0060/serio0). Aug 12 18:44:00 tablet kernel: atkbd.c: Use 'setkeycodes 69 <keycode>' to make it known. to make the up arrow on-screen button work as the page-up key. Add acerhk in /etc/modules to make it auto-load on boot. In the phase 4 we'll assign values to special keys on every boot trough an init script. Once that the kernel "knows" the special keys, we can assign actions to "special keys" presses. 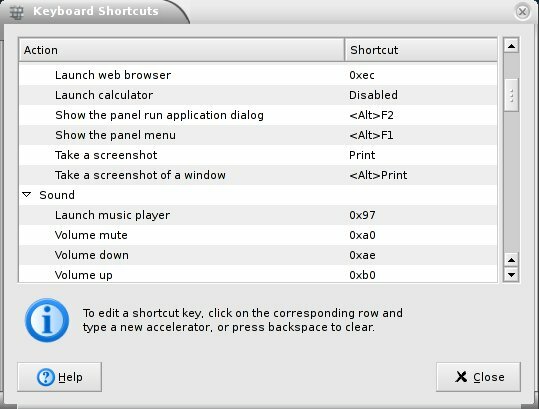 I use Gnome, so this is a task that can be easily accomplished through Application->Desktop Preferences->Keyboard Shortcuts. For example, you can set to adjust volume settings by pressing Fn+Up, Fn+Down and Fn+F8 exacly as you do in Windows, launch browser/e-mail client by pressing the two appropriate buttons, or lock the screen by pressing the "key key" on the screen. If you don't like gnome you can try the 'hotkeys' daemon (# apt-get install hotkeys). You may want to adjust touchpad default settings. Look at /etc/default/tpconfig for that. Time to get the stylus working. As the Linux Wacom Project HOWTO tells us, it's to be treated as a Wacom serial device. We have to use setserial to configure the serial device. you can change ttyS0 to some other unused ttyS? if needed, but remember the number you choose because you'll need it while configuring X. Of course we need to have the command performed at boot. Time to configure X. We need to add in /etc/X11/XF86Config-4 three input devices (cursor/stylus/eraser) and enable them in the active server layout. Start from my XF86Config-4 or copy/paste this code chunks in your file. Last thing: we need xinput (# apt-get install xinput) to enable stylus right-click. This isn't a persistent setting and has to be performed after X startup, so I suggest you to put the command in a xsession script. for info/details about xsession scripts. It was a nice surprise to discover that the modem is perfectly working, as my previous Acer notebook had a never_got_working softmodem. Get slmodem-2.9.10.tar.gz and the slmodem-2.9.10-abby.diff patch to make in compile under recent kernels. This is what I did at the time of writing, maybe that now you can find a more recent no-patch-needed version on the smartlink website. Now move to slmodem-2.9.10/scripts/debian, edit the slmodemd script (I only adjusted the region setting to ITALY) and move it to the /etc/init.d directory. Use modconf to activate the slamr module (you find it in the "extra" section). initializes the modem device (/dev/ttySL0). Of course you can add a symlink in /etc/rc?.d to the script if you want the modem be initialized on every boot. This didn't need particular tuning. or use modconf if needed, and be happy. This was a bit tricky. New versions of the driver come frequently, so check the official website for updated info. You can try to install the module "the Debian way" (# apt-get install ipw2200-source and then read docs or try with module-assistant) or ignoring the debian packaging system. I choose the last one because I needed features available only in the latest driver release, not yet Debian-packaged. Start from here, find and download. - turn off the "kill switch"
There's also kernel stuff that must be enabled for general wi-fi working, firmware loading and cryptography. If you started from my .config, that stuff should be ok. Otherwise, check the readme and install files of the ieee80211 subsystem and of the ipw2200 driver for details on what to enable. Of course you'll install the wireless-tools package to manage the adapter if you haven't already, but this is another story. to turn on/off the kill switch is not so funny. So let's make things a little better with some scripting, with the little ipw2200ctl script. I did this init scripts to set the wlan/modem status and initialize the acer special keys on every boot. I hope you find them useful - put in /etc/init.d and set them to start at some runlevel as usual. Edit initAcerC300 to set modem and wlan adapter boot status. initAcerC300 calls the ipw2200ctl and slmodemd scripts to enable/disable wlan and modem, and does general stuff as initializing the special keys with setkeycodes as we did in phase 2. Remember that you had already placed slmodemd script into init.d while configuring the modem, and put acerhk in /etc/modules so that it should be already loaded when calling initAcerC300. You can generally use /etc/init.d/ipw2200ctl start | stop to enable/disable wlan. The script simply turns off/on the kill switch and loads/unloads the ipw2200 module. Have I missed something? I hope not. I'm happy with the Gnome Desktop Environment. Here you are a screenshot of my current desktop. There are lots of useful/nice panel applets... and gdesklets are cool too. My favourite desktop applications are Mozilla-Firefox as browser, Mozilla-Thunderbird as e-mail client, gaim as instant messanger and X-Chat as IRC client. NVU is really quick for editing web pages without writing a single line of HTML by hand. OpenOffice is a high quality office suite. File -> Preferences; Input Devices - Configure Extended Input Devices. Set the three stylus devices to "screen" and enjoy. 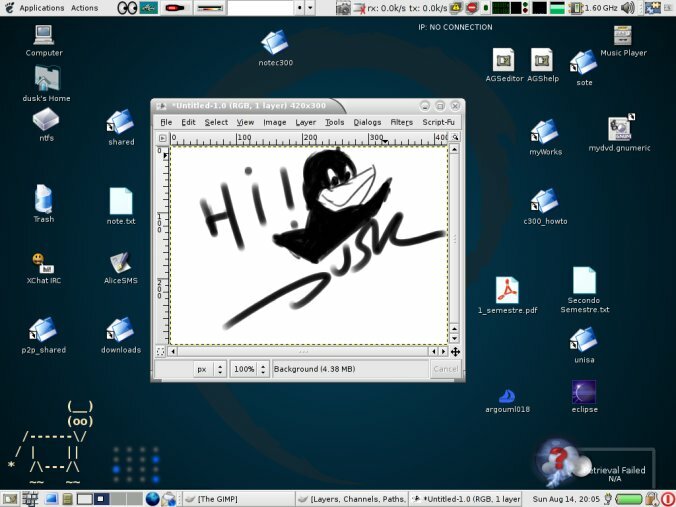 I sometimes have to use Windows (games and some windows-only-bad-emulated softwares) , so before the Linux install I resized the WinXP partition but not removed it. A problem of FAT32 is the maximum single file dimension (I think around 4 Gb). So if you need, for example, to use a big DVD image and aren't able to split it in more than one file, adjust your partitioning (for example, make the NTFS partition 5 Gb bigger, make the DVD image from Windows and read/mount it from both Win/Linux from the NTFS partition). Here's a screenshot of my current partitioning. The WinXP primary partition on the beginning, the extended partition with two linux installs on ext3 (one for testing stuff and one for my everyday use), a swap space partition and some unpartitioned space (I'm planning to play with vmware soon). After that, the big shared data partition, FAT32. At the end, the mysterious acerdata 8 Mb hidden partition. Having a read/write shared partion is useful for lots of stuff. For example I like to have mail and bookmarks shared. Firefox: in the two Win/Linux profile folders, edit pref.js to make it point to the same bookmarks file. 6 is the gid of the "disk" group. This way all members of this group can work with the two partitions.